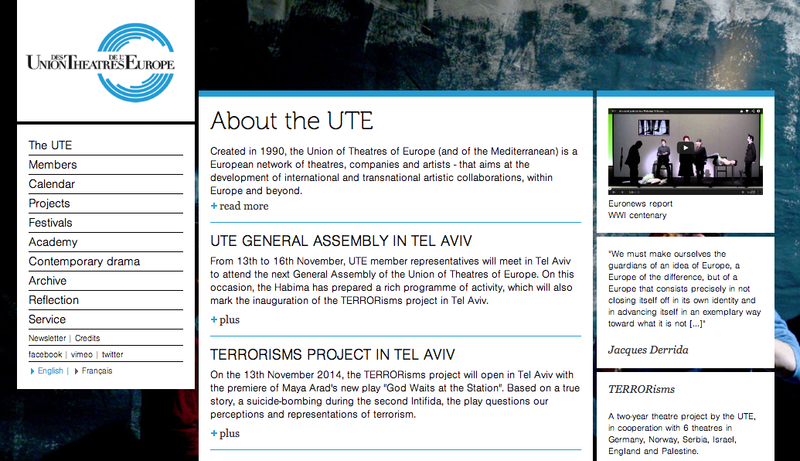 As set out in our previous post, a Terror Special Conference was billed as part of the ‘rich programme of activity,’ on 13-16 November in Tel Aviv, prepared by Israel’s national theatre Habima for the attendees of the 2014 General Assembly of the Union of Theatres of Europe (U.T.E.). To discuss ‘The Democratic Dilemma in the War on Terrorism’ was a chilling line-up that included a former director of Mossad, former head of the security section of Shin Bet, a former Director of the Counter Terrorism Bureau of the Israeli PM’s office, and an Israeli Philosophy professor who wants to change the laws of war to remove protections afforded to non-combatants. Although – to our knowledge – that event took place on 14 November, U.T.E. has now deleted it from their website page for the general assembly programme. On Friday 14 November, Habima Theatre will jointly host with the International Institute for Counter-terrorism (ICT) a seminar on ‘The Democratic dilemma with Counter-Terrorism’, located at the Interdisciplinary Center (IDC), Herzliya, Israel. The IDC is a private, right-wing university highly complicit in Israel’s military industrial complex.